I'm not sure I'm leaving this in the right place, but I'd like to just take a moment to recognize some of the brilliant things that Hidekaz Himaruya has done for the web comic/ manga and additional writers for the anime too! I was watching season five (The Beautiful World) of the anime today, and noticed something very interesting in episode 14 (Brother! We Are..!!). 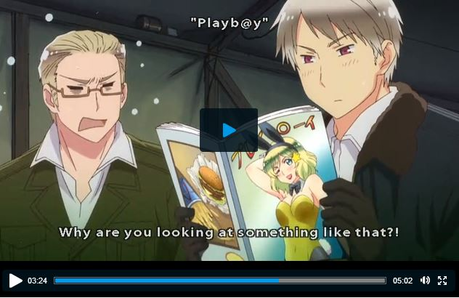 When Prussia picks up the dirty magazine that is in the crate at the american camp there is a cute girl in a bunny costume on the front. She looks pretty familiar after watching "I was Surrounded by Heroines", right!? My first instinct was to laugh that Nyomerika would be posing for the cover of a dirty magazines, but then I had to step back and appreciate the cleverness of the foreshadowing. "I Was surrounded by Heroines" was the 25 episode in the same season (special for DVD) and was released in February of 2014, nine months after "Brother! We Are..!!". That is incredible detail in such a lighthearted comedy. So I looked online for others who have noticed this, and I found no one. Not even a screen cap! I did find a picture of the original manga, but the cover was a hazy shape of no one particular which, in my opinion, just proved how much thought and revision goes into this story. That settles it. I'm addicted to Hetalia! I'm sure there are plenty of gems in there... That's what I'd like to talk about!